Ladislav Mednyánszky (1852 - 1919) is one of the prominent representatives of Central European painting of the last third of the 19th century and the beginning of the 20th century. The mansion in Strážky is the only place in Slovakia in which a permanent exposition of his work is presented. The exposition documents Mednyánszky's bond to Strážky, since his life and work are strongly connected with it. He spent most of his childhood there and constantly returned as an adult. His only permanent studio, which was built for him by his father, is located in Strážky, above the farming wing on the premises of the mansion. The exhibition of Mednyánszky's work in Strážky documents the painter's artistic development predominantly from 1900; his primary motifs were the surroundings of Strážky and the great natural beauty under the Tatra mountains. His landscape painting reacted to the influences of predominantly French landscape painting, the so-called intimate landscape, which he transformed in his own artistic expression. Expressing the impressions from the landscape which reflected his mood became his basis. The first section of the exposition presents the painter's early period connected with the Tatra mountains motif, as well as his first portraits of local peasants, farm laborers and coachmen, distinctive types of men, who, he a less rugged person, greatly admired. The second section of the exposition predominantly incorporates works from the 1880s with motifs of forest hideaways and figures on a bridge inspired by the Strážky surroundings. Not only landscape painting, but also the number of preserved portraits and portrait studies completes the picture of the work of Ladislav Mednyánszky. The group of so called unfinished works, predominantly portraits, which Mednyánszky, after capturing the basic form of the portrayed person, left in this working stage, is a unique collection. The third section reacts to the turbulent period around 1895, when the artist's father died. Overcoming his death became the main theme in this period, which is documented by the motifs of death, spirits and melancholy motifs. The war paintings constitute another motif. Mednyánszky actively participated in World War I as a war artist and he not only captured the horror of war, but also everyday life in camps. 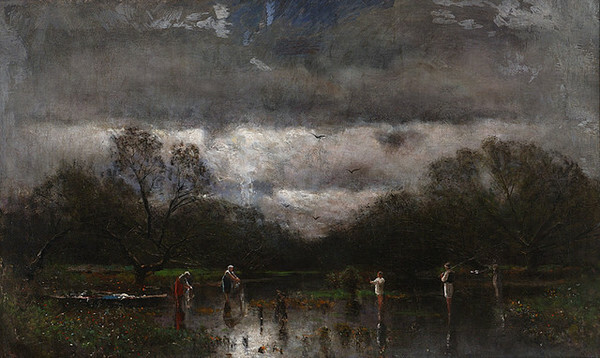 He also frequently connected the figural genre with the landscape genre. The exposition is also complemented by large landscape works (particularly from the period around 1900). This pertains to diverse approaches to perceiving the landscape from classically apprehended works up to expressive paintings. The collection includes works of Ferdinand Katona (1864 - 1932) the painter's student and painter from the Spiš region, who was greatly inspired by his teacher. The figure of Ladislav Mednyánszky is permanently connected with the mansion in Strážky. The exhibited set of works originated directly from the family estate and is complemented by further SNG purchases from private collections. This exposition features a selection from the large collection of the works of Ladislav Mednyánszky, which deals with the early periods of his creation and documents individual development phases and his journey in search of his artistic style. The artist's family administered a large collection of his works preserved in relatively compact form with an emphasis on those works created between 1875 and 1900. In his later period, Mednyánszky himself no longer sold or exhibited his earlier works. During World War II, a part of his collection was destroyed and another relatively large part was exported from Trenčín to Great Britain. In 1972, after the death of Margita Czobelová, the artist's niece, Strážky and a greater number of his works became the property of the Slovak National Gallery. In 2000, this collection was enriched by a set of paintings from the remainder of the Strážky inheritance. From the beginning, Strážky were a favourite motif for Mednyánszky's works. Besides the dominating features of the settlement (such as the Renaissance tower) he was also interested in the surroundings of the chateau and park, the countryside and the motif of the bend in the Poprad river nearby. Strážky also suited his solitary nature; he could wander for hours and study the changeability of nature. The melancholy quality of this place, remote from large centres and intellectual loneliness had an equal affect on his work. The selection of the theme constituted an interesting element of Mednyánszky landscapes. Under the influence of French intimate landscape painting from the surroundings of Barbizon, he began to paint forest interiors, hideaways and simple views in the country. He liberated the landscape from its composition of the19th century and loosened it in order to capture the mood or impression through it. His depiction of trees, which were his favourite theme from childhood, is relatively frequently repeated. The theme of the road that narrows at one point is often found in his landscapes. The motif of the bend in the river or the road becomes a central axis of his paintings. 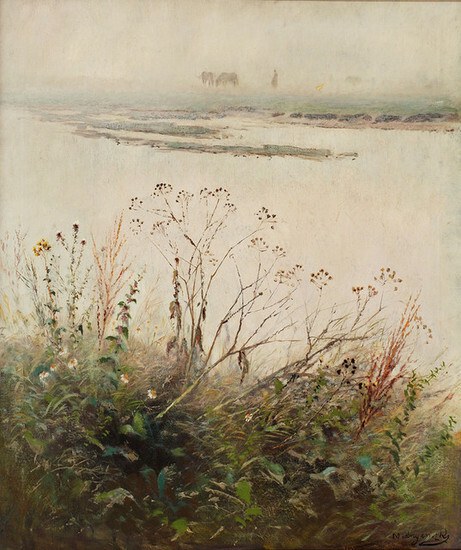 Mednyánszky's improving painting skills brought about a change of themes (landscape by night, nature in fog, storm, rain, and morning dusk). Direct observations of nature in the field, about which he frequently kept written records, were part of his creative process. His comments about the state of light in a given situation or time indicated when the sketch was made (morning, dusk, sunset) next to the individual drawings and sketches of nature are found in his diaries. 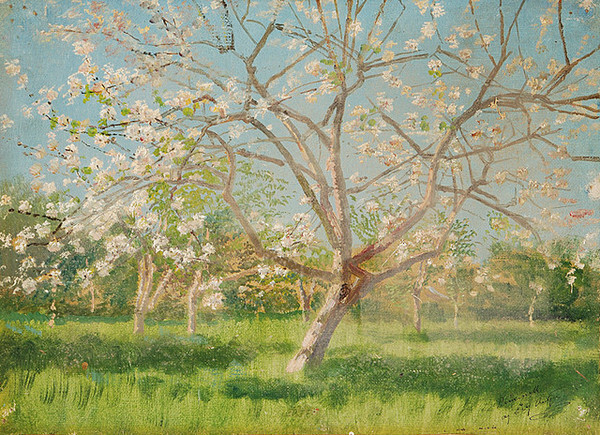 Around 1900, the author painted light compositions of blooming orchards and vineyards under the influence of Impressionism. He unchained himself from gloomy dark compositions and began to use lighter shades. In the period around 1910 a breakthrough occurred in his work when the symmetry of the previous periods in individual compositions was replaced by more energetic brushstrokes. Mednyánszky was not only interested in the natural surroundings of Strážky. Portraits and portrait studies of grooms, peasants, coachmen, farm labourers and tramps constituted the second thematic group of his work. Simple people that he met and knew not only in Slovakia but also during his stays in Budapest, Paris or Vienna interested him. In his diaries he kept notes about interesting characters that he met. With some of them he was bound with a strong friendship and he supported them throughout their entire life. Baroness Miri Czobelová, the artist's sister, organized salons - regular meetings of artists and writers at the Strážky chateau. Ladislav participated in some of them and awarded his friends with animal names within the framework of this "circus". Depictions of the family and family friends are the continuation of the group of portraits. Portrait of Brother -in-law Štefan Czóbel is preserved from the period of around 1887. At that time, the Portrait of a Friend (writer Zsigmund Just) was identified based on photographic material from the Mednyánszky inheritance in the archive of the Slovak National Gallery. Just's close relationship with Mednyánszky is also documented by the fact that the writer described the artist in his novel Fiumus from 1894, where he is depicted as the character, Lipót Czobor. Zsigmund Justh was also a leading figure of the Debating Society, which presented the idea of the revival of higher social layers with the help of peasantry, in which Mednyánszky was also interested. Imrich Czóbel, another of Mednyánszky's portrait subjects, was also a member of this society. In the 1890s, particularly during his last stay in Paris, Mednyánszky became interested in the depiction of full figure compositions with the theme of poverty and usury. The studies of interesting human types, which are unfinished from our perspective, also come from this period. The author considered such compositions as complete as soon as he captured the expression of the portrayed person. The painting entitled Odsúdený / Sentenced, which originated in his so called sadist period and expresses the motif of passivity and full submission to one's destiny, is exhibited at the chateau in Strážky. The symbolic-melancholy works are from the beginning of the 1890s and culminated around 1895 when the artist had to cope with his father's death. His feeling of loneliness was also manifested in his work. The Spiš stylizing of catafalque portraits, which we can also find in the family gallery at Strážky, came to the fore. The influence of symbolism is also manifested in the works which proceeded this sad period of the artist's life. After 1900, a change can be seen in Mednyánszky's work, particularly in his approach to themes. He abstracts individual motifs to basic symbols, and uses a wide brush to loosely apply the paint. His work is concluded by the works from the pre-war and war periods in which figural and natural motifs blend into one. The figure of Ladislav Mednyánszky is permanently connected with the chateau at Strážky. This set of paintings comes directly from the chateau family inheritance and is complemented by other purchases of the Slovak National Gallery from private collections. It offers a partial view of the creative development of Mednyánszky's work while also documenting the influence of the local genius loci of Strážky.